Emily and Peter both met at work but didn’t hit it off until a work trip in Florida. After dating a year, Peter proposed to her at a private area at Lincoln Park Zoo in Chicago during the holiday Zoo Lights. Afterward, a limo was waiting to take them around the city and ended at one of their favorite Chicago staples, the Chicago Athletic Club Hotel. Their friends were waiting to surprise the couple and to celebrate. Peter had asked for permission beforehand, and on their trip to see family for the Holidays the time together became that much more special. While the couple both lives Chicago, Emily is originally from Detroit, and Peter is from Indianapolis, so a destination wedding sounded like an opportunity for both sides of the family to have a great vacation together. Emily said, “We knew our family was going to have to travel anyway”. With their Destify agent Brandi, they spent a lot of time researching destinations and resorts. They even took a trip to Punta Cana, in the Dominican Republic, and none of the possible resorts stood out. 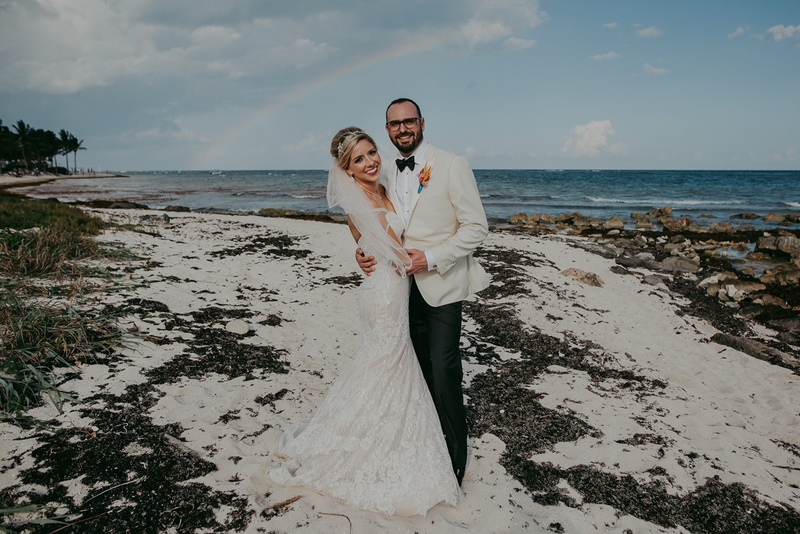 Upon further research, they found the Dreams Tulum resort and booked their wedding for Mexico’s beautiful Riviera Maya area. The couple both agreed that the wedding department knocked it out of the park, and they could not say enough nice things about them. Emily sent inspiration from her Pinterest boards, which the team made a reality. They even visited the resort in March, before the wedding, to finalize all of the venues and meet the wedding coordinator in person. The site inspection made the couple feel rest assured in their resort choice. The couple took full advantage of the resort’s venues and amenities once they were there for their wedding. As a welcome reception the couple booked the brand-new rooftop terrace above Seaside Grill where guests got to mingle while enjoying the stunning ocean views. Before the wedding Emily scheduled a trial run at the on-site salon to make sure her hair and make-up was perfect for the big day. On the day of they held their ceremony on the beach at 4pm. Afterward their guests attended a cocktail reception while the couple took pictures with their photographer. During the cocktail hour guests were treated to a Mariachi trio, who then escorted the guests to the private reception in Dreams’ Secret Garden venue. Emily said, “I cannot say enough about the beautiful venues we chose”. The couple recommends doing your research before your destination wedding. It’s a good idea to have a clear vision of your budget and décor, flowers, etc, since you don’t typically begin working with your wedding coordinator until 3 months before the wedding. Emily also recommends having trust in your wedding department, they knew what they were doing. You don’t need excessive extras, you’re already in a beautiful setting. Everyone had a blast!